Conveniently located in Sector 128 of Noida and a part of the 1162 Acre Jaypee Green WISHTOWN, The Pavilion Court offer apartments with serene views of nature on one side and refreshing golf views on the other. Complete with all modern amenities these are fully-finished, modern, hi-efficiency apartments come in 1, 2 and 3 BHK configurations. They offer generously proportioned spaces that emphasize on optimum space utilization and reflect stylish living. The interiors follow the modern trend of open and continuous spaces and natural lighting with more windows making the apartments feel larger, lighter and more spacious. The Pavilion Court also offers a host of value-added features like multi-level security system, piped gas line, 24 hr electricity and water supply, split air-conditioning in all rooms, wooden flooring in bedrooms and under ground parking facility. And as a privileged resident of these apartments, one can enjoy the unsurpassed amenities of the Wish Town such as the 18 + 9 hole Graham Cooke designed signature golf facility, a number of social clubs, recreational facilities and the Town Centre with facilities like art galleries, restaurants, cafes and high-street retails. 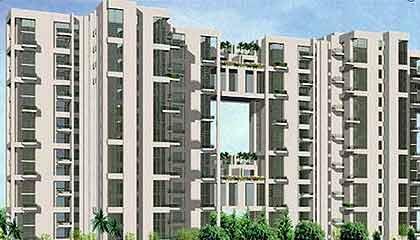 The Pavilion Court stands off the Noida-Greater Noida Expressway in Sector 128, Noida. The DND Flyway is just 10 min away from the site. It enjoys good connectivity with other parts of the city through a network of existing and proposed sector roads. Greater Noida is 15 min away from the project site. A multi speciality hospital, an institutional complex and a commercial area with 5 star hotel, retail and office space are all within the township. Amity Business School and Botanical Gardens are also close to the site.